Most people don't immediately associate French furniture styles with Canada, but when you stop to think, it is obvious that French Canada must have produced some regional variations of classic French furniture designs. 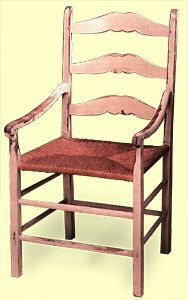 This mid-18th century chair is a typical Capucine arm chair from Quebec. Like most French provincial designs, it is comfortable and sturdy.